Um dos primeiros exemplos online de canvas infinito, "When I Am King" 15 julho 2001, explora principalmente o scroll horizontal - uma tendência que se mantém pouco usual- e vertical. Apesar de acusar a idade, o seu impacto nos que o descobriram então não pode ser menosprezado. Respect. How can comics use digital technology to their own advantage and remain faithful to their distinguishing features without being too purist or fixed in their traditional form? The medium is still suffering from an identity crisis, as it has become clear with scholars continuing struggle to find an appropriate definition of what comics actually is. It has tried to lean on the visual arts, as well as literature, for support, to allow it to gain legitimacy as a form. However, this has caused even more confusion and disagreements among scholars regarding the origin, nature, and purpose of comics. Appropriating blindly any hybrid form containing comics elements as belonging to the medium of comics, then, would only complicate the matter further. ...e cruzado à origem: o papel impresso, o livro. It is necessary to detach the notion of comics from the notion of comic books. Most comics scholars would probably vote against this procedure, as the “shortcomings” of print represent the characteristic appeal and form of classic comics. It"s notoriously difficult to define comics and in the case of digital comics this might prove even more challenging due to the malleable and ever-changing nature of digital media, in constantly "in danger" of becoming something other than a comic. (...) Being a combination of visual and textual components, comics offer many ways in which these can be reshaped and presented in a new light. The physical limitations of the printed page are lifted as computer screens offer virtually unlimited space to arrange comics panels. The conceptualisation of comics as tied to the comic book is understandable, since the medium was born and popularised in print, and some of its main characteristics, such as the speech balloon, the motion lines, and the graphic sound effects, emerged precisely because of the limitations of print. But now that the medium has managed to become integrated on the digital realm [torna-se necessário] substitute the original traits of comics with the more realistic and natural ones offered by the digital media. Nenhum caso contrário ao limite físico das páginas é mais evidente que no canvas infinito (*). E este tem quase sempre sinónimo de webcomics. * Mesmo se esse pode ser tudo menos evidente. One can differentiate between two basic categories of webcomics: webcomics intended to be printed, which use digital distribution as a support and promotion of the printed comic; and those intended for digital viewing, and use the Internet and computer-based technologies as their main host and distribution platform. Crucial in their difference: the intention of the webcomic creator, and their engagement with the medium. Dos enhancements possíveis - haveremos de ser mais exaustivos futuramente -, ocupa-nos apenas daquele que prossegue tradições indies d.i.y. : os que se fundam nos comics/web, não os que se afundam em gaming audiovisuais com o $$$ em mira. Infinite canvas manages to lift some limitations of print comics without changing the overall feel too drastically, while animated and voiced webcomics, as well as interactive or game comics, have a much higher inclination to transgress into domains of other media and transform themselves in order to accommodate and integrate these novel foreign features. The use of infinite canvas in enhanced comics appears to be one of the most logical routes traditional comics take when transferred onto the digital medium. (...) It is then fair to say that infinite canvas webcomics can still be considered a continuation of the comics medium. Mashup generoso para o "Digital Comics: Harder, Better, Faster, Stronger?" 21 nov 2016 excepto onde indicado em contrário ainda pelo caso do papel-livro-digital-ecrã. Time-based events forced comics creators to find ways of representation [that] eventually led to a well-defined identity for the medium of comics. (…) As comics migrated onto the computer screen these limitations disappeared and the opportunity arose to incorporate time-based events and other elements, which were unthinkable on paper. 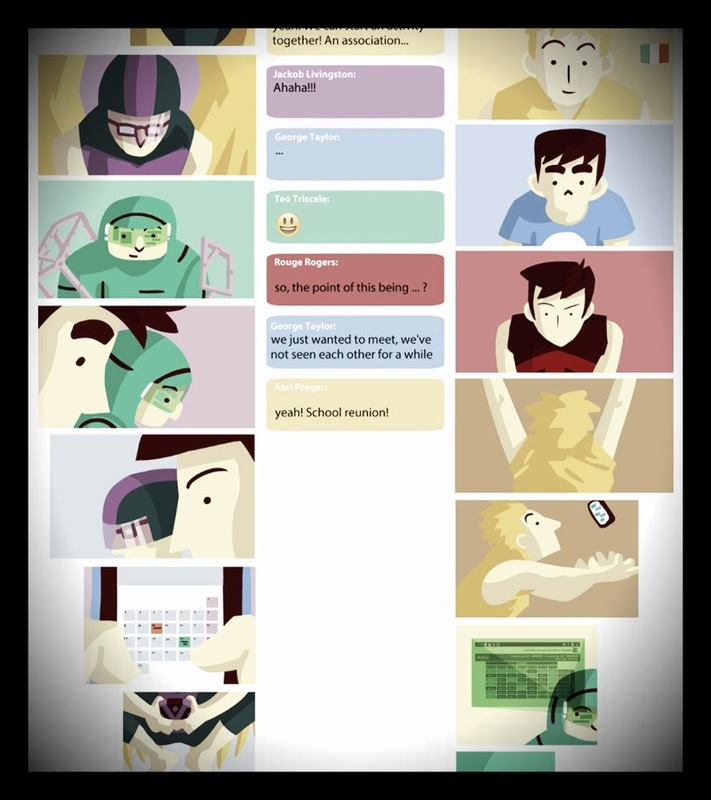 As technology evolved and allowed for an easier and more sophisticated manipulation of digital media, the first interactive and animated comics started to sprout [e] become augmented through the use of animation, sound and interactivity to the point that their classification as comics is questionable [if] adopted many new functions of the digital media, without actually adapting them to the medium of comics. The idea of the panel, and the sequential arrangement of panels on the page are still very intimately connected with the medium of comics. Comics were "invented" with the printed page in mind. (…) One can use front-end programming languages [+ other disciplines and art forms, such as animated videos, soundtracks, videogames & several digital techniques, such as parallaxing, animation and sound effects] in order to manipulate the way these elements will be displayed, and whether there will be interaction with the reader. But is that what comics readers want to see (or hear): substituting the onomatopoeic sound-words so characteristic to comics with the actual sounds might be more realistic, but is it appropriate? Painéis, ainda Matthew Thurber: excepção à regra da BD-filme/áudio? Mere verbatim digitizations of the physical comic book. As such they try to preserve the charm and the familiar feeling of comics even on the digital devices; however, the lack of physicality of the page makes reading "digitized" comics more cumbersome than pleasant. The landscape orientation of the typical computer screen often conflicts with the prevalence of vertically oriented comic books. The absence of direct tangible contact and the less than ideal ergonomics of a computer interface further hinder a pleasant reading experience. The comics undergo an extra process of adaptation to the digital screen. 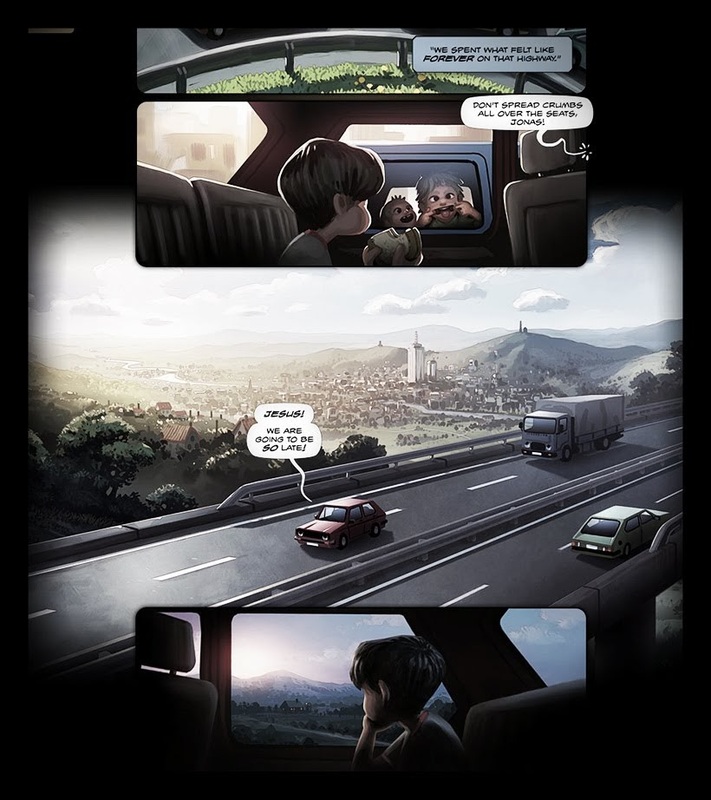 Comixology "Guided View": breaks the comic pages into single panels, showing them usually one by one and often accompanied by elaborate transitions and effects. However, Guided View interferes with one of the most important principles of comics, namely having hermeneutic and temporal control over the comic. 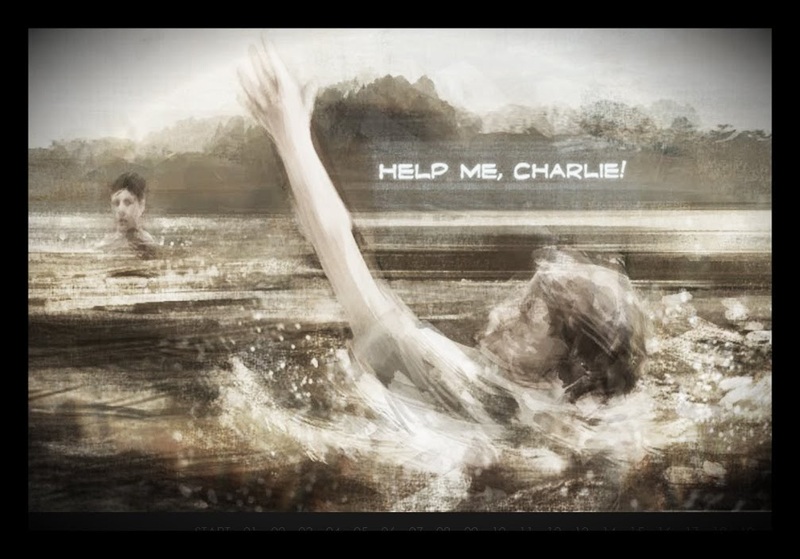 Madefire "motion books": pushed too far, making the comics look like animated shorts aspiring to be something other than a comic. The technology can also make it hard to control the flow of panels. Going back or forth a panel means clicking through all the loaded animations, which can be quite cumbersome. Google "Bubble Zoom": aimed at tablets and other medium-sized devices allows the reader to increase the size of speech bubbles at the press of a button. Many comics strive for so-called "immersion" through video clips and interactive ludic elements. But this offers mostly a passive experience, contrarily to the active mode that reading requires. Loading the comic with elaborate and impressive effects does not necessarily make it great and engaging. It is a video, awkwardly animated out of drawings that once used to be a comic. 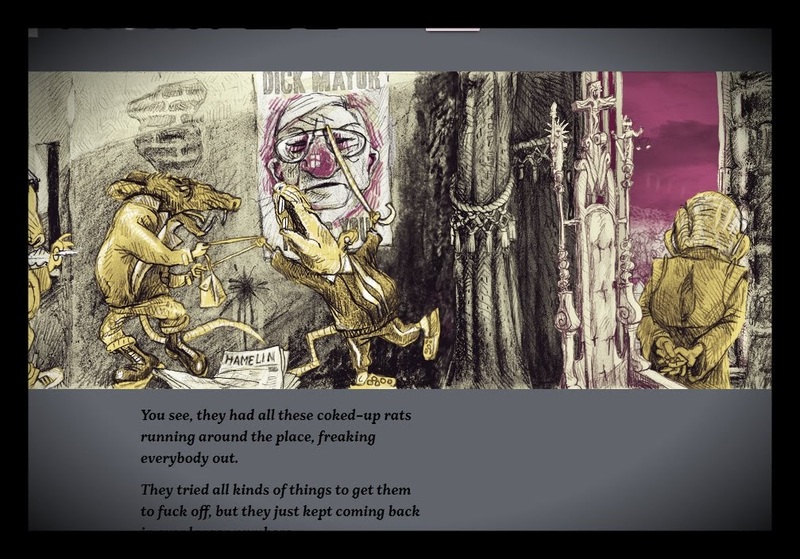 Speech bubbles are replaced by voice-over dialogue, and the reader has no control over the pace of the story bar pausing and skipping through the video. Would a fully developed and properly animated movie not be more appropriate? Do excesso: "a transformation by which different elements are connected and merged into each other, thereby creating a new form" ou " a by-product of the clash of the two media" ? Synchronous animation with sound belongs to a different realm in which comics stop being comics: the result of animating static images taken from the comic book, which is still strictly an animation [e] results in somewhat awkward scenes, where the moving objects appear like paper cut-outs moving across the screen. The form of the comics is lost, and there remains only a decorative comics feeling. If one adds a more detailed dimension of time (through sound and motion), then comics" unique “multi-image structure […] becomes superfluous, if not a nuisance, and is not likely to endure”. Usually entirely animated and supplemented with a soundtrack, sound effects, dialogue. These small animations do not substitute for the interpretative cognitive effort that is required in traditional print comics: the readers are required to use the same hermeneutic process to connect the story bits as they would in comics with static images. Comic-like digital works that require an excessive amount of user interaction tend to cross into the field of video games: the comics elements risk acquiring a secondary status, and appear to be used mainly for aesthetic purposes: more of a game enhanced by means of comics elements. The effectiveness of the digital comic depends on the way in which the same technology is implemented in the comic. Comic creators should strive to adopt simpler ways of constructing a narrative. It is not necessary to use the latest innovations in visual art, nor the latest interaction design framework. Using web technologies to guide the reader through the narrative or provide supplementary information can result in an efficient and rich presentation. The stylistic modes of the chosen medium should be used in such a way that they reinforce the exposition of the story in a clear way. By taking control of the medium and using its methods to full potential, the strengths of the story can be highlighted. 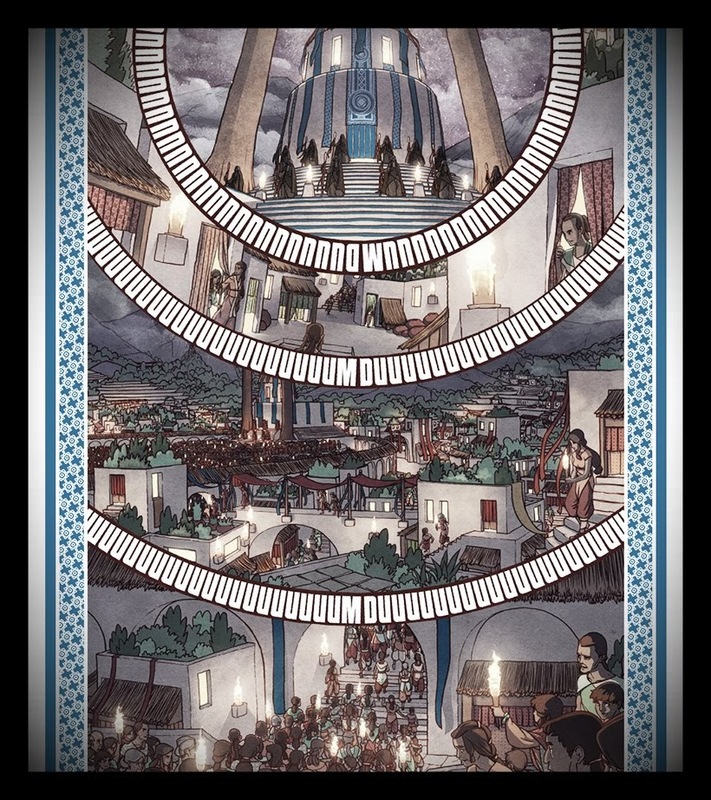 In the specific case of digital comics, this translates to being aware of the myriad of possibilities made available with digital technology and applying them effectively to the sequence of images and text that make up a traditional comic. Scrolling, dragging or clicking through a digital work of art feels more intimate than merely watching the comic unfold. If we see that our clicking and dragging affects the structure or constitution, we will have a better sense of it and will gain more knowledge about its inner working and functionalities. This might correspond most to touching a book and grasping a sense of its dimensions, the thickness and the texture of its pages, or the quality of its binding. Exemplo xkcd "Click and Drag" 2010, "simple stick-figure style complemented by a use of the digital techniques not too exceptional but simple enough to be used in various situations and in various ways", como "alt text", "animated GIF images" e "big vertical images / infinite canvas". Terceira nota, preocupações com o 3) mobile. Demoremos o nosso tempo porque não estaríamos a tratar de BD em digital sem a revolução do aparelho de bolso. Digital comics are very dependent on the size of the device the reader is using to view them. One can always try and zoom into the image or switch the orientation of the device, but that would not solve the problem. It has not been easy to find a very successful way of optimizing comics reading on small digital devices. Beside the obvious limitations in size, reading a longer piece on a smartphone can be a challenge in itself, as it is easy to become distracted or disturbed. Having to constantly interact with the screen to zoom in and read the speech bubble or to change panel or page can be tiresome and greatly hinders comic’s immersiveness. Comic creators [need] to consider the specifications of the medium their comics will be distributed and contained on from the beginning of the creative process [using] front-end webdesign coding languages in order to adapt and optimize comics viewing on different devices [and] make the experience somewhat more pleasant and natural. Usually short or have short and serialized episodes, and are meant to be consumed quickly and on the go, as is common with digital content. Common to have only one panel per page, with the device acting as the panel frame. ...e de volta à imprensa? This has given rise to a lot of newspaper-style comics. Web e bds de longo-quase infinitos a quantos-mais-curtos-melhores.